New China MEPS have become legislation since June 2018. 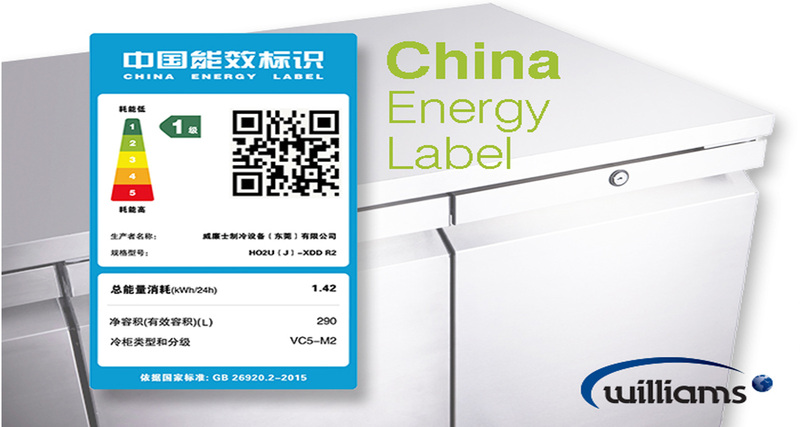 Improving the energy efficiency in the market trend in the industry. It means that there are dramatic changes ahead for the equipment manufacturers but it should be positive. The MEPS is to help reducing energy consumption and CO2 released in the foodservice industry by ensuring manufacturers are challenged to bring to market ever environment friendly products. Our team of innovative engineers have been busy using the best available technology, to make sure our latest range of cabinets and counters are our most energy efficient to date. And most of the Williams hot products in China have already passed the standard. The ranking will be displayed by means of an energy label thereby enabling rankings to be used as part of the buying decision. The ranking of (5) will be the minimum energy performance level with the highest ranking product being (1). Any product falling below the minimum performance level (5) will not be eligible for sale in China. This will ensure manufacturers are continuously looking to improve the ranking / energy consumption of their products. The MEPS standard in China is tough now, but Williams team is well-prepared for this and ensure Williams products to reach the global standard.